Is Your EVOO Real Or Fake? 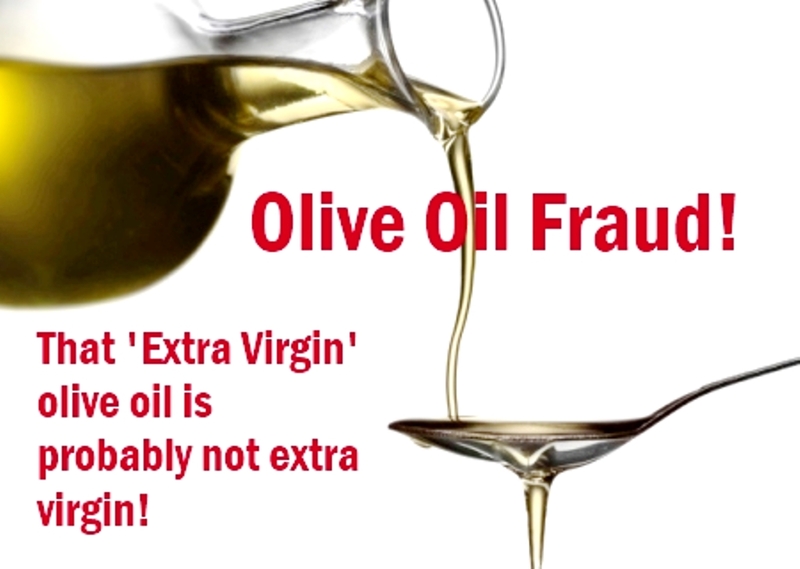 It's reliably reported that 80% of the Italian olive oil on the market is fraudulent. Some experts think that percentage is an exaggeration. Others believe that the bigger problem is poor quality olive oil, deliberately mislabeled as virgin or extra virgin. In any case, it's likely that when you buy olive oil, you're not buying what it says on the label. Gangsters in the kitchen. Food Crime. Agromafia. Elite Food Police. FBI of Food. Police Food Squads. Hidden cameras. Wiretaps. Tampering. Corruption. Counterfiting. Smuggling. These are terms frequently repeated in recent news stories related to olive oil. “Much of the extra virgin Italian olive oil flooding the world’s market shelves is neither Italian, nor virgin,” the New York Times warns. 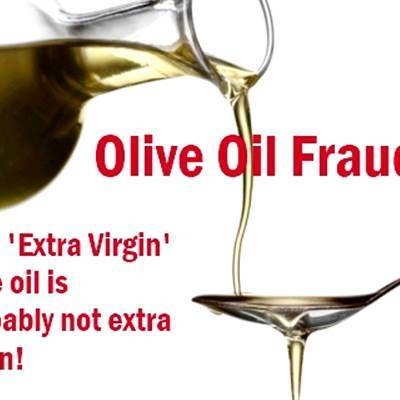 So unless you bought it directly from a producer or a certified distributor, the olive oil in your kitchen marked “Italian extra virgin” is very probably a fake. Either it's low quality falsely marked as virgin or extra-virgin - and not even from Italy - or it's been mixed with other oils of dubious provenance. At worst, it's not olive oil at all but a vegetable oil disguised with coloring and aroma. Yet, you bought it despite the fact that its low price should have tipped you off. You want the worst news? Traditional, well-known brands haven't escaped the evil: Many adulterated olive oils are sold under quality brand names. Yet, supermarkets are full of them. Oh, my mistake - that wasn't the worst. Here it is: Even the labels bearing the coveted "Protected Designation of Origin" or PDO stamp indicating the precise geographical origin of a particular extra virgin olive oil to ensure the quality of that region’s agricultural products, and which are subjected to more strict controls, have not escaped the illegal trend. Yet, governments continue to permit the entry and commercialization of those products. For years, David Neuman, an olive oil expert and taster who is CEO of the Greek food company Gaea North America, has been warning about adulterated and mislabeled oils and finds it particularly frustrating that consumers, retailers and governments are turning a blind eye to the widespread fraud. “There is good olive oil and bad olive oil everywhere, and there are many Italian producers who stand by their product," he told me. "But the extended nature of the Italian problem is affecting all the rest of Europe." For him, the most serious issue is the fraud committed against the consumer: “The olive oil sold in supermarkets should meet the established standards. And that is not being upheld.” Even in Italian supermarkets, the rate of fake olive oil on the shelves is estimated at 50%. Let's start with the most recent revelation, related to labels. Generally, if a label says that the virgin or extra-virgin olive oil comes from a controlled place of origin - Puglia, for example - it's reasonable to expect that the product has passed through the required quality controls, particularly when it's destined for export. But despite the efforts of the Italian government to stop what's become known as the agro mafia now controlling most of the olive oil production and marketing - as well as numerous campaigns by the region’s producers to regain their reputation and cleanse the “made in Italy” branding - a massive olive oil scandal is being uncovered in Southern Italy ( Puglia, Umbria and Campania). It involves olive oils from Syria, Turkey, Morocco and Tunisia, bottled and sold as authentic Italian extra virgin to foreign markets, particularly the United States and Japan. That discovery came to light in a bigger undercover operation by the Italian police, dubbed “Mamma Mia,” that last week revealed another massive scam in the same region: Thousands of tons of low-quality oils from Spain and Greece also passed off as extra virgin Italian. And that scandal followed yet another connected to an investigation of seven of the best-known Italian olive oil producers, including Bertoli, Sasso and Carapelli, allegedly selling fake olive oil as extra virgin “made in Italy.” The companies have vehemently denied the allegations. A study last year by the National Consumer League found that six of 11 bottles of extra virgin olive oil from three major retailers—Whole Foods, Safeway SWY +0% and Giant—failed to meet extra virgin requirements. “America is the dumping ground of all those fraudulent operations,” Gaea's David Neuman explained. “There are not enough resources to control the over 350,000 tons of olive oil entering the country. That's why, even after the scandals, adulterated olive oil bottles are still on supermarket shelves.” Neuman thinks that the problems with fake olive oils have been going on for so long that consumers have become accustomed to buying bad oils at low prices. “Although consumers are embarrassed to admit it, they are supporting the situation,” he says. “The chain stores keep buying because it sells and everybody has become addicted to the low prices." That has serious effects on the market of authentic virgin and extra virgin olive oil that naturally are more expensive. “There's no incentive for grocery stores to get the good stuff," he added. The situation has been exacerbated by Xylella Fastidiosa, a bacteria that kills olive trees - one million so far in Puglia, the largest olive oil producer - and threatens to extend to the rest of Italy and other Mediterranean producers. The bacteria, compounded by bad weather, has devastated Europe’s olive harvest and raised the price for authentic olive oil by as much as 20% across the continent. The Financial Times reports that in 2014-15, global olive oil production fell 26% to 2.4 million tons, after output in Spain and Italy had already been virtually halved, according to the International Olive Council. As a consequence, an unexpected country has reaped benefits: Tunisia. “The poor European harvests coincided with a bumper crop in Tunisia, catapulting the North African country to the top olive oil exporter spot and second-largest producer after Spain,” says the FT. So the only oily recommendation I can offer you next time you're puzzling over the olive oil selection at the market is this: Caveat emptor. Neuman's advice is more detailed: Buy it, take it home, open it, smell it, swirl it in your mouth as you would a fine wine, and judge for yourself. If it doesn't pass that test, take it back to the store and demand a refund.